If you ask Larry Beck, "arch-o-holism" is the only addiction to have. 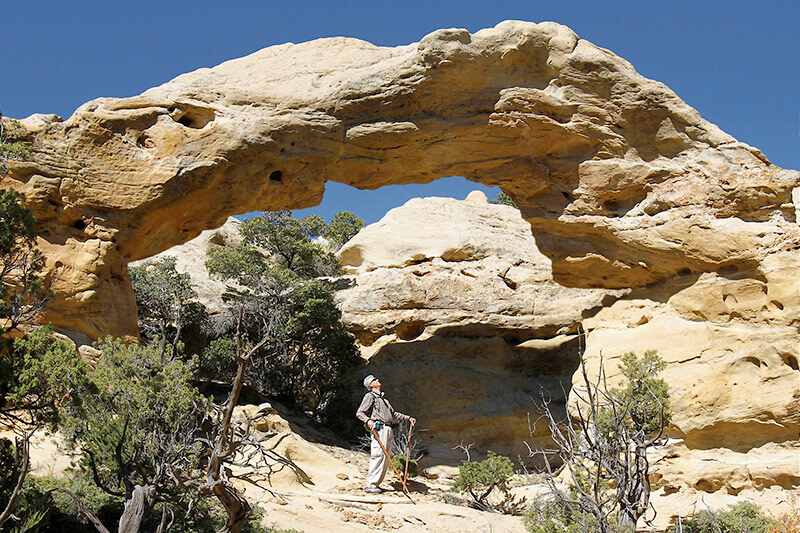 Beck, president of the Natural Arch and Bridge Society, member of Seniors Outdoors and admitted "arch-o-holic," has been actively hunting natural arches throughout the Southwest for more than 20 years. Beck, at age 67, shows no signs of slowing down. "People ask, 'Where do you live?' and I tell them, 'I don't know, I guess wherever I'm parked,'" Beck said. "Oftentimes I'll drive down an old oil and gas road I've been down many times before and, suddenly, the sunlight will pop and sparkle through a tiny opening in the distance against the mesa and I'll pull over and take a closer look. And there — like it was born that morning — is another one and I go after it." 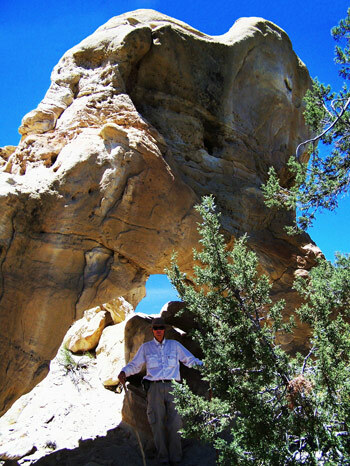 Beck, now retired, spends most every day exploring natural San Juan sandstone arches across New Mexico on his own, with arch society members on its biannual week-long "arch rallies" or as a guide for various interested groups, at no charge. There are more than 450 known arches in the state, including more than 150 in San Juan County alone. Beck has discovered more than 300 himself, about 60 this year alone. "I'd rather do this than anything else," he says. "You never know what you're going to find around the next corner." A natural arch in the Southwest is typically a stone formation eroded over time by the elements, typically water, that create window-like openings framed by a stone archway. Some are in plain view, easily reached from a major road, while others are hiding in plain sight and take a clever eye at the right time of day to spot. While not always as well-known or large-scale as those in Utah or Arizona, hundreds of arches throughout San Juan County offer some dramatic and mesmerizing types and sizes that keep hunters like Beck on a constant quest for the next discovery. The taxonomy of natural arches works as a kind of shorthand to identify the natural rock formations based largely on their overall appearance and formation history. Most common in the area are arcs, bridges, buttresses, pillars, potholes, alcoves, fins and meanders. Beck credits Chris Moore and Robert H. Vreeland — both arch enthusiasts, authors and deceased — with inspiring him to meticulously document and passionately pursue arches. "It's a great hobby for anyone who likes to hike and enjoys the outdoors," he said. "And the arches here are so unique, the way the water forms them, is just mind-blowing." One of his favorites is less than a 30-minute drive from downtown Aztec. It is a natural bridge arch, 30 feet tall and 36 feet across, called the Bridge of Wonder. Some of the arches are named after the objects or animals they resemble, though Beck prefers to simply number them in the order they were discovered. The most notable arch in a particular canyon will carry its name. The state has arches named for a coffee pot, a woodpecker, an elephant, a caterpillar, a horse hoof, an octopus, a two-headed snake, an old person's hand, an hourglass, a hoot owl, a pizza pie, a teardrop, a handrail, a pin cushion and the Liberty Bell. 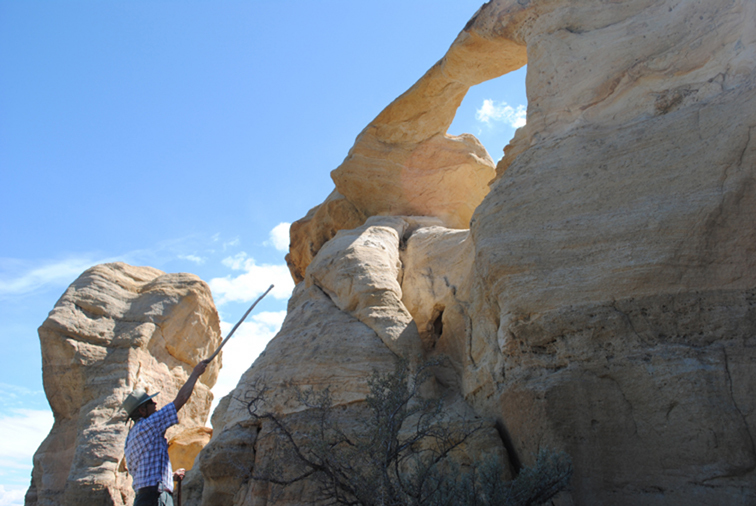 During a 2007 arch society rally, Beck discovered a fin arch in Crow Canyon, just east of Aztec. Despite his protests, the society members elected to name the arch after Beck, Beck's Beauty. Some rock formations capture Beck's attentive eye, like a rock formation of freestanding pillars that resemble chess players in Largo Canyon or a 15-foot court jester near Blanco. One of the widest arches Beck discovered this year he named Solstice Arch, a 47-foot-span buttress arch he found on solstice day, June 21, in Largo Canyon. "I just take 'em canyon by canyon, working my way from Aztec," he said. "My methodology is really quite simple — I drive slow and pull over and hike in if I see something 'archy.'" Beck grew up hiking and exploring the outdoors in Espanola, north of Santa Fe. "My folks took me out to see Tea Kettle Rock, in Jarosa Canyon near Cuba, when I was 12 years old," Beck said. "There's a black-and-white photo of me standing under its spout. There may be an inkling of why I love exploring there." And while Beck has personally covered dozens of canyons through the years, Largo Canyon remains "the big enchilada" with countless potential discoveries that lie in wait. Not all arches remain as fixed features in the bucolic New Mexican landscape. Four arches Beck discovered have fallen in the last few years, an inevitable fate for the porous sandstone formations that undulate through the canyons of the Southwest. Beck credits his prolific arch discoveries to the hundreds of oil and gas roads snaking throughout the lesser traveled areas of the state. Their reach offers arch hunters like Beck the ability to more easily penetrate deep into the canyons that offer untold arches for discovery and enjoyment. "I'm the biggest fan of the oil and gas industry, aside from the folks getting the royalties," he joked. "With these roads, you can cover more distance and find more arches than you ever would be able to do on foot. But I tell people to avoid parking anywhere near the drill sites, to be careful of the 'three-step' gas." Beck, a retired accountant and Vietnam veteran, used to hunt for arches on an off-road motorcycle outfitted with wide tires, but back pain forced him to trade it in for a 4x4 diesel truck with high clearance he dubs his "arch-mobile." Traversing the oil and gas roads that snake for miles through endless canyons, Beck, armed with his high-end digital camera and two walking sticks, navigates the twisting, shrubby paths that weave through slippery sandstone formations, a skip in his step and a wide smile on his face. "It's the thrill of the hunt," he said, his truck bouncing along deep gouges in a rolling dirt road after a heavy September rainfall. He pulls over in Cuervo Canyon on a recent Monday morning. "After it rains, these roads are as slick as goose grunt, and that's slick," he said. "I want to find them all, but that'll never happen. I know I'll never be able to explore it all," he admits. "But it's endless fun going around hunting for new discoveries." Beck spends winters in Arizona, but reserves the summer months solely for arch hunting. "Ninety-five degrees or not, I'm out every day, looking for them," he said. "I call for 'em, 'Here, Archy-archy." Beck insists the transformative experience of just venturing a few miles out of Aztec can work wonders on the body, mind and spirit. 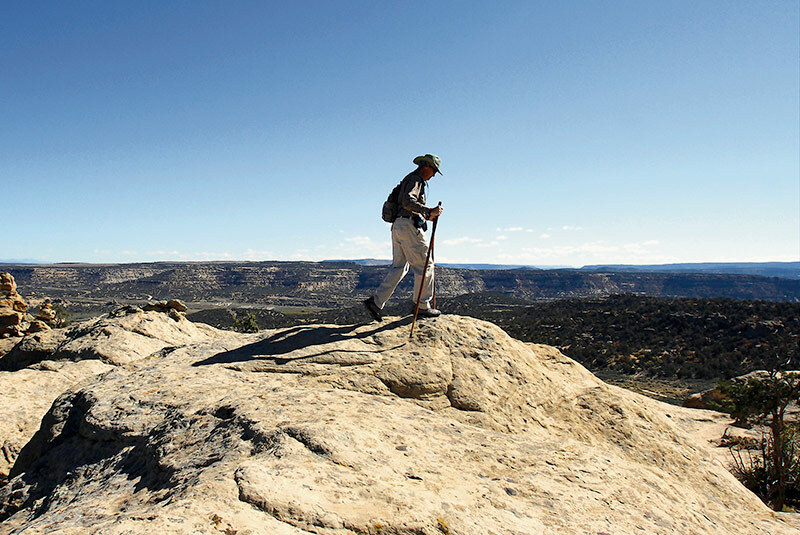 "Get off the couch, turn off the TV and get hiking," he said, taking in the panoramic view from atop a mesa in Crow Canyon. "You can see forever, from the La Platas to Wolf Creek and the Continental Divide in one sweep. This is what life's all about." Beck donated a Bureau of Land Management map he meticulously labeled featuring many of his favorite arches in canyon lands stretching from Aztec to the Jicarilla Apache Indian Reservation. More comprehensive is a notebook he organized by canyon names that include color photos and detailed information on the nearby arches with GPS coordinates in each canyon along with directions to each from The Wines of San Juan, in Turley. Beck also has produced more than ten different DVDs for sale at the winery, including the "Arches of Aztec" published in 2008. "The map I made and the arches directory will always be available to anybody who's interested. They can come by, have a glass of wine, look at the map, look at photos. See what they like and what's nearby," he said. Like Beck, Edward Kotyk, admits to having a touch of "arch-oholism" in his blood. Kotyk, city of Aztec project manager, has a degree in archeology and spends any spare moment outside hiking through nearby canyons armed with his camera. Kotyk has also discovered his share of natural sandstone arches around Aztec, many of which he has photographed and posted with helpful information in an index of nearly 300 arches organized among 25 canyons throughout the county. Kotyk has made arches easy to find and enjoy with free, downloadable Pdf files by canyon at the city's tourism website, aztecnm.com. Each arch is ranked by its desirability (one star: "not worth a hike" to five stars: "a must see") and accessibility along with site etiquette and travel advisory information. "I go out hiking when I can," Kotyk said. "I've photographed every arch I've found for the last three or so years on my get-away time." Kotyk insisted he and Beck share a friendly rivalry to see who will discover more arches in the area. "(Beck) gave me his list of arches he's discovered. Then I've found new ones myself," Kotyk said. One of Kotyk's favorites is Crow Canyon Arch [photo at top of this page], a dramatic, arcing rock formation, roughly 30 feet wide and 20 feet tall, and a Vreeland discovery, Octopus Arch, a pothole arch with a 30-foot span, in Cedar Hill. 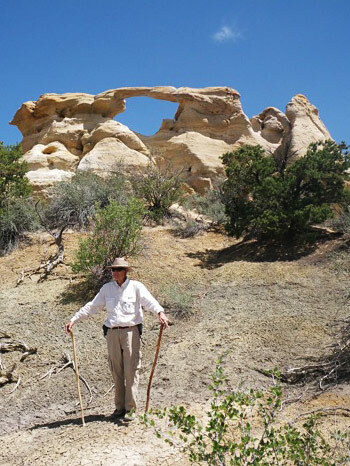 On a hike in 2011, Kotyk's wife, Neykar Kotyk, found a fin arch in Alamo Canyon, near Aztec. The sandstone arch that spans nearly ten feet now carries his wife's name, Neykar's Arch. Beck and Kotyk hope to help promote the natural spoils that are short trips from nearby Aztec and Bloomfield. Beck is currently working on forming a local chapter of the arch society, now in its 25th year, in San Juan County. "Even if you don't find an arch (when you go looking), just boogie on. The scenery in these canyons is just incredible. It's a wonderland of rock," Beck said. "There's something about rock that just gets in your blood." To view detailed information on nearly 300 arches around Aztec that Edward Kotyk has documented on the city’s tourism website, go to www.aztecnm.com/arches/index.htm. Searchable topographic and geologic maps of Northern New Mexico are available at the New Mexico Bureau of Geology and Mineral Resources’ website, geoinfo.nmt.edu. James Fenton covers Aztec and Bloomfield for The Daily Times. 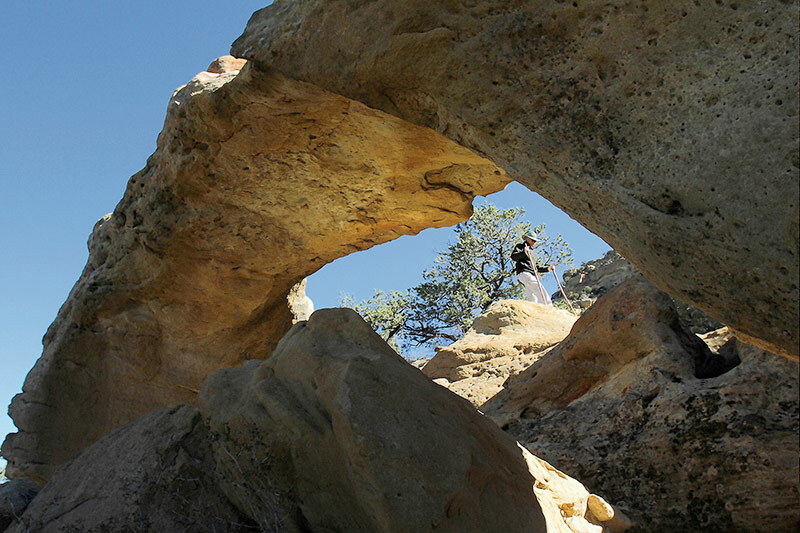 More than 150 natural arches are documented in San Juan County, all by one man. Larry Beck [photo at right], 66, began documenting natural arches more than 30 years ago in the Four Corners region. Now, it's all he does. "There's so much beauty up here, and it's right in your backyard," said Beck, who's helped bring nation and worldwide attention to the area's fragile formations. Beck discovered his first arch in 1981 outside of Durango, Colorado, where he used to live. The arch was sandstone and formed over millions of years by erosion, as most in the region are. While not as large as other arches in the Southwest, Beck realized those in San Juan County were largely underappreciated. "So many people don't have a clue," said Beck. Beck expects there are many more arches to be documented in San Juan County. The number of total arches in the state he believes is incalculable, though he has documented more than 300 in New Mexico. "In every direction you go, there are arches," Beck said. For each arch, he has taken a picture and noted the arch's location and how to get there, which is information he later posts online. Many locals have taken advantage of the information, though. So too have arch enthusiasts from around the nation and the world. 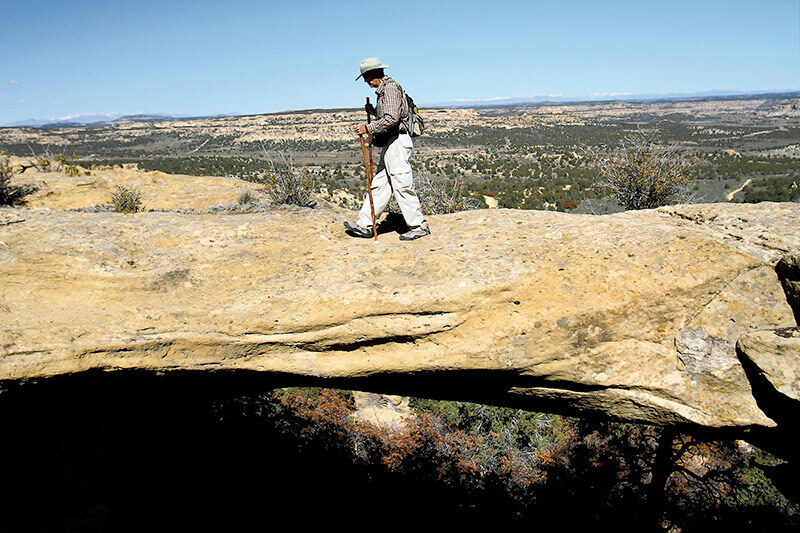 Beck, president of the Natural Arch and Bridge Society, a global network that supports the interests of both amateur and serious researchers of natural arches and bridges, invited the Society in May to see San Juan County's arches. Most members traveled cross-country, though several traveled from England and the Netherlands. "They loved this one," said Beck of Graceful Arch, an arch outside of Aztec [photo at right]. Anyone, however, can get to the locations, most of which are easily visible and accessible from the roads used by oil and gas companies. Beck's website provides much of the information needed to find documented arches in the San Juan County, including detailed directions and GPS coordinates. The city of Aztec also provides information about its own arches on its tourism page, a page they created after learning about Beck's research. "It was a big inspiration in terms of letting me know how much was out there," said Aztec Projects Manager Ed Kotik, who learned about Beck's work and later started doing his own. Kotik, projects manager for the city, said he was inherently interested in Beck's ventures because Kotik formerly was an archeologist. "It's the thrill of discovery," said Kotik. For more information about arches in the Southwest, visit www.flickr.com/photos/archseeker/. Arch enthusiasts also are encouraged to join the Natural Arch and Bridge Society, which you can find out more about at www.naturalarches.org.